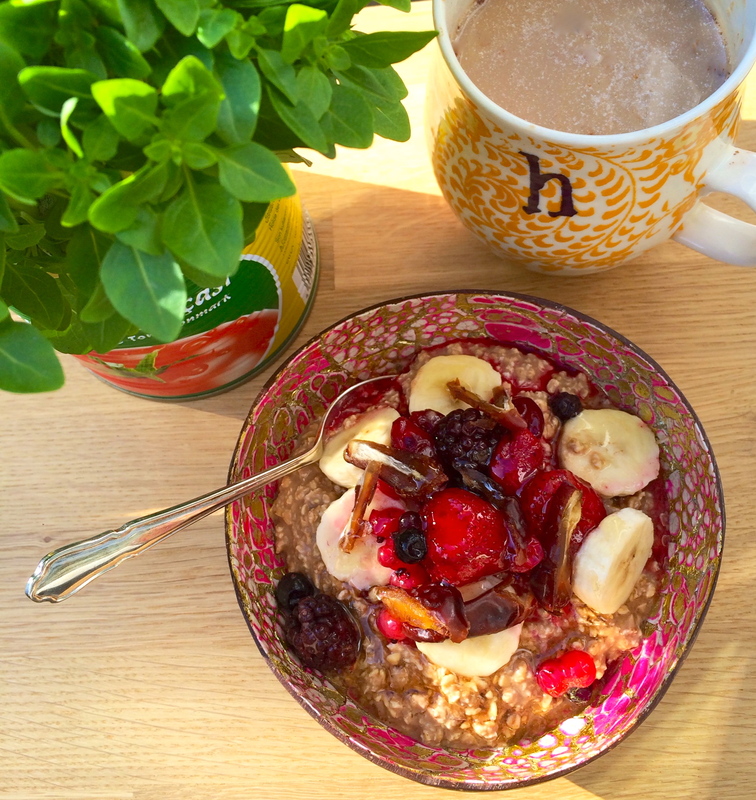 Breakfast is my favourite meal of the day, and I love porridge more than anything! There is something so comforting about it, and it keeps me going until lunchtime. However, summer is just around the corner and sometimes it quite frankly feels wrong eating a steaming hot bowl of oats when it’s sunny outside! But I could not possibly go an entire season without my porridge fix. And this is where my overnight oats come in! The basic idea behind overnight oats is that you have a ratio of 1:1 with your oats and your liquid, mix it all together and then leave it in the fridge overnight to go all gooey and delicious so it’s ready to eat when you wake up. It’s such a versatile recipe, you can choose whatever you like to go in it. The one I like best is Cacao and Hazelnut oats because it’s just oh so chocolatey! Add the milk, oats, cacao and two finely chopped dates together into a jar and give them a good shake. Then just pop the jar in the fridge, and have a lovely long sleep! The oats will do their thing overnight, so that you have a delicious breakfast awaiting you in the morning. It’s a very portable breakfast, so if you are in a rush, just pop the final chopped up date, sliced banana and berries into the jar and take it with you to work. Lets be honest though, I know its very à la mode, but eating out of a jar can be rather messy and you just end up with food all over your knuckles and a grubby spoon. So why not just be old fashioned and pour it into a nice bowl ok? Sprinkle your fruit on top and get stuck in. You can add some honey or agave nectar if you prefer, but the chopped up dates that have been left in overnight with the oats go all lovely and soft and release their sweetness, so I don’t think it needs anything more. And there you have it, a lovely bowl of oats with a summery feel, perfect with a cup of tea or coffee to start the day. It’s a very versatile dish, so as long as you work on the 1:1 ratio basis, you can pretty much put whatever you like in. Banana, almond milk and cinnamon works particularly well too! 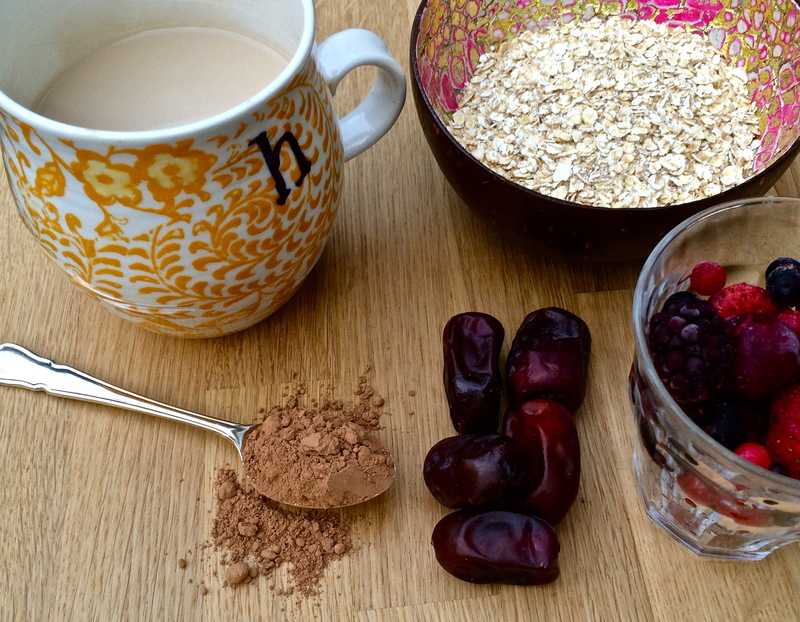 And you can sprinkle anything you fancy on top- flaxseeds, pumpkin seeds, almonds, blueberries, cherries, figs…. the list goes on. Let me know if you have any personal favourites- I would love to hear them!